Kerala onam sadya recipes for Onam festival include popular sadya items in this blog which you can prepare for onam sadya or vishu sadya. Hope this list will be helpful for you to plan your Vishu sadya menu & Onam sady menu for 2019 (or any celebration where you want traditional Kerala style sadya). This is not a complete list for sadya, since there can be many more items which can be served, and the menu may also depend on different regions with in Kerala based on what items are popular there. However this is a simple guide for planning the lunch menu for any sadya with easy recipes, which you can easily make at home. These are vegetarian sadya menu with popular onam/vishu sadya vibhavangal (recipes) which you can follow easily and make the sadya at your home for yourself or for any onam/vishu gathering or potluck or any Kerala festivals. The traditional Kerala style onam sadya recipes include traditional and authentic Kerala vegetarian recipes which are delicious, and most of which are healthy too. You can enjoy this dishes as part of Kerala cuisine as they are served for Kerala style lunch or dinner. They are commonly prepared at Kerala homes for lunch & dinner (they are not just for the sadya or feast). Some of these dishes are very traditional and authentic like authentic sambar recipe and authentic avial recipe. Some are easy recipes which you can make quickly like this easy one pot sambar recipe and this easy cucumber pachadi without coconut. Kerala onam is very famous and traditional Kerala festival (south Indian. The Kerala onam sadya or sadhya is the traditional and popular Kerala feast served as part of Kerala onam festival celebrations as well as other celebrations in Kerala like weddings or any traditional Kerala style celebration. Vishu is another very popular Kerala harvest festival where you can enjoy the sadya. The dishes are traditionally served in fresh banana leaves, although you can serve them in regular plates or banana leaf platters if fresh banana leaves are not available. There is an order for serving the recipes, as one side of the leaf is used to serve the rice, wafers (kerala papadam), and banana chips, and the other side is used to serve the pickles and dry curries. The gravies to be served with the rice are served one by one and after the rice is done, the dessert is served in the same leaf. The desserts are usually popular puddings made using milk and sugar or coconut milk and jaggery (traditional brown sugar made from palm trees or coconut trees). The popular puddings are vermicelli pudding and rice pudding and many more. After the dessert is served, rice is served again as a second serving if needed,and then proceeded with some other items like rasam which is a mix of spices which can be used as drink or can be served wit rice. Onam and vishu sadya dishes are rich with many traditional and modern dishes served in a very unique style in fresh banana leaves and the feast is very filling and delicious with a lot of varieties in items. The dishes served for Kerala onam sadya can slightly vary according to the different regions of Kerala. 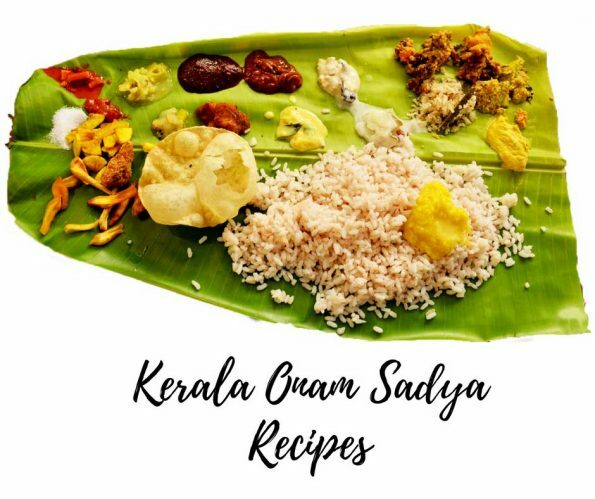 So here you can see popular Kerala recipes for Kerala onam sadya and vishu sadya, most which can be used for the side dishes in any Kerala sadya for celebrations. You can view all these recipes as a collection here as Kerala sadya recipes. Hope you found this post on Kerala onam/vishu sadya recipes for preparing simple and easy sadya helpful!